During the late 1980s and early 1990s Capriccio undertook a whole raft of recordings of the works of Kurt Weill composed or conceived before his departure from Germany following the rise of the Nazis to power. This series was particularly valuable for a number of reasons. Firstly, because it included first recordings of many works which were either totally unavailable or only to be had in the form of excerpts. Secondly, because until that time the only recordings of various other works from this period were to be found in the series undertaken by Weill’s widow Lotte Lenya for CBS in the 1950s after her emergence from retirement following her husband’s death, when her restricted resources could no longer cope with the vocal demands which the original scores made upon her. This meant the employment of wholesale transpositions and (understandably, given her status) the transfer to her of various songs originally written for other roles – both of which played havoc with the structure of the music, as well as fostering the erroneous belief that Weill’s music didn’t really need ‘proper’ singers. Thirdly, the Capriccio releases came in proper scholarly editions which had no truck with unauthorised transpositions and employed operatic singers in the roles which really needed them. Finally they also came with full documentation on the texts employed, and the words of the pieces involved and translations. A couple of years ago I welcomed the re-emergence of Capriccio with reissues of various obscure works from the German operatic repertoire, noting that although many of the pieces concerned had received subsequent recordings the quality of some of the solo singing entitled the recordings to a continuing presence in the catalogue. At the same time however I lamented the fact that Capriccio had removed from the reissues the complete texts and translations that had been provided at the time of the original releases, noting that this omission comprehensively undermined the value of the reissues themselves. 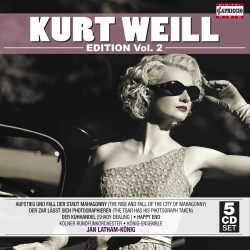 The same observations unfortunately have to be made about what is advertised as a “Kurt Weill edition” which assembles the Capriccio recordings, many of which still remain unchallenged in the catalogues as representative of the works involved. It is impossible to imagine that either Weill or Berthold Brecht could ever have approved of an ‘edition’ which totally sidelines the contributions of the librettist. As I have observed, the original issues again contained the complete texts, which could at the very least have been made available on line – but no reference to such availability is made in the new booklets, and the incidence of spoken dialogue especially in the text by Georg Kaiser for Der Silbersee makes this particularly regrettable. The pages of English notes in the booklets do not even include synopses of some of the works concerned, although these can be located on the webpage of the Kurt Weill foundation. Even so, these are no substitute for the original closely argued and detailed texts. As it is, the value of these reissues is fatally compromised. One can only hope that Capriccio will reconsider, and make the texts and translations as originally provided available online. In the meantime these two sets can hardly be recommended to those new to the works — and that will be the greater majority of potential purchasers. The two sets of five discs each come in a pair of sturdy boxes which could easily have accommodated substantial booklets. There are many alternative versions of the Threepenny Opera but even John Mauceri’s otherwise admirable Decca recording makes a number of questionable editorial decisions – the use of transcriptions for both Ute Lemper and Milva, the provision of a newly composed accompaniment for Lucy’s aria — performed in the Capriccio set with Weill’s original piano — and the use of full operatic voices some of whom sound out of sympathy with the demands of the style. The operatic singers in the Capriccio recording, notably Jane Henschel and Walter Raffeiner, sound much more at ease in the idiom, and the two sopranos who take on the roles assumed by Lenya in her recording don’t need to make any transpositions. This reading has all the grit and dirt of the original without making such alterations to Weill’s score. The recording of the other major work here, The rise and fall of the city of Mahagonny, is rather less successful. The problem comes not with the singers but with the slightly polite approach to the orchestral writing. Anja Silja is an inspired choice for the leading role - she quite succeeds in making the listener forget Lenya. The use of a small body of strings may be authentic, but it does make for an anaemic effect in places which might have been helped by more tactful microphone placement but these considerations take on less importance beside the presentation of the score as Weill originally wrote it. At least, insofar as we can determine what Weill wrote, since all of his theatrical works were the subject of frequent adjustment during the course of rehearsals and even runs of performances. In Mahagonny this means the omission of the ‘Crane Duet’ which – given the singing of Silja and Wolfgang Neumann – is a loss keenly to be felt. Lenya’s recording includes it but makes cuts elsewhere and it does mean here that the recollection of the material during the final duet between Jenny and Jimmy makes little sense — although surprisingly that does seem to be the way that Weill originally wrote it. There is a recommendable alternative reading of Der Silbersee with the London Sinfonietta, but this omits much of the dialogue which we are given here in full – and which would be much more valuable if we were provided with the necessary information as to what it was about. There are more versions of Happy End and the Seven Deadly Sins, including performances in the Lenya series. Here we are given the latter work with the transpositions that Lenya found necessary, but this can be justified even on musical grounds since Weill made these alterations prior to the first performance. Happy End includes the full spoken dialogue by Brecht, which is worthwhile in its own right. The singing casts throughout are excellent, with major names among them – Barry McDaniel, Marita Napier and Hans Kruse, for example, in Der Zar lässt sich photographieren. Which brings us back to the other works in this edition. For many of them – The Tsar has his photograph taken, The Lindbergh flight, Der Jasager, Der Kuhhandel – there are simply no alternatives in the current catalogues; and all of these are works which deserve at least an occasional airing. Indeed some of them were not available even in the form of excerpts before these discs were originally issued. A ‘Kurt Weill edition’ is the ideal place in which to find these recordings but the absence of texts and translations remains crippling. The original issues have long disappeared from the listings, and second-hand copies on Amazon are relatively expensive - £12.30 for a second-hand copy of Der Zar and twice that for Der Lindberghflug, for example. Downloads are cheap enough, but again a purchaser will run into the same problems with texts. Incidentally, when looking at second-hand copies you may also note that some works included in the original issues – Down in the valley, The Ballad of Magna Carta – are missing from this new edition. It is unclear why these recordings have been omitted, since there would have been plenty of room for at least some of them on these discs. Any potential purchaser is faced with a real quandary here. Either you invest in the whole two boxed sets of this edition in order to obtain the rarities – in which case you must either speak German fluently or must be prepared to try to obtain the texts elsewhere. I would have thought translations would be even more difficult to find. You could look around for second-hand copies of the original issues but these would probably be an even more expensive option. Unless Capriccio are prepared to reverse their policy on the provision of proper supporting material for their reissues — and it is, I hope, still not too late — this ‘edition’ is going to be a dead duck. This is all the more disappointing, since the performances and recordings are excellent, with Jan Latham-König — who directs the majority of the readings — clearly totally in sympathy with Weill’s style and idiom. What an opportunity has been missed here.